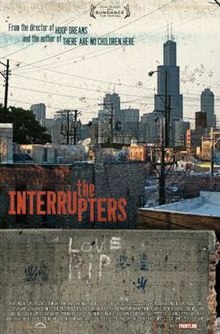 The Interrupters is a 2011 documentary film, produced by Kartemquin Films, that tells the story of three violence interrupters who try to protect their Chicago communities from the violence they once employed. It examines a year in which Chicago drew national headlines for violence and murder that plagued the city. The film features the work of CeaseFire, an initiative of the Chicago Project for Violence Prevention. In 2004, Tio Hardiman (ex-Director of CeaseFire Illinois) created and implemented The Violence Interrupter concept. Violence interrupters Ameena Matthews, Cobe Williams and Eddie Bocanegra look back on their past experiences with street violence to try to steer young men and women in the right direction. Matthews, the daughter of former Chicago gang leader Jeff Fort, comes to the aid of the mother of Derrion Albert, a Chicago high school student whose death made national headlines when it was captured on videotape. Produced by Kartemquin Films, The Interrupters is directed by Steve James, director of the highly acclaimed documentary, Hoop Dreams, and co-produced by Alex Kotlowitz, author of the award winning book, There Are No Children Here.